Nellie Casman was born an 1896 in Proskurov, Russian Empire (now Khmelnytsky, Ukraine), and came to the United States in the early 1900's. She raised in Philadelphia. The daughter of a khazn (cantor), Casman played child roles until 1910, then appeared as a soubrette, mostly in Yiddish vaudeville. In 1918 she replaced Bessie Thomashefsky at the PeopleвЂ™s Theater, playing opposite David Kessler. Her most popular character was a "Little Cantor" in the Aron Nager's play "Dos Khazndl". Casman was especially known for her couplets, as well as shows, which she wrote with her husband, composer Samuel Steinberg. Their musical comedy The Showgirl was performed by the Shalom Yiddish Musical Comedy Theater at Town Hall in 1982. 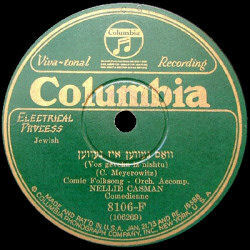 In 1923 they wrote Yosl Yosl. В This song became one of the most enduring in the Yiddish repertoire and was popularized in English by the Andrews Sisters in 1938. 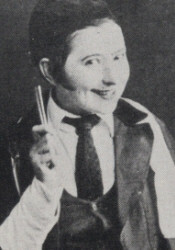 Casman played later in English-language radio and television, and continued to perform Yiddish vaudeville well into her 70s. In 1973, she appeared in the film вЂњThe Adventures of Rabbi Jacob.вЂќ Casman also played the character Pathe during the eight-year run of the television show вЂњThe Goldbergs,вЂќ and on the earlier radio version. She reprised this role in the 1950 film version. Last years Nellie Casman lived in New-York where she died in 1984. My heart is always aching. yosl, ikh krapir nokh dir! oy, oy mayn khayes geyt mir oys on dir. dayn malke zitst nokh alts un vart oyf dir.